"It looks, just looks fantastic," said Nicole Stott of the "very shiny ball HTV" in the "beautiful view." The United States astronaut was looking through the windows as she spoke to Houston before she and other flight engineers, Canadian Robert Thirsk and Belgian Frank De Winne, used the station’s robotic arm to grab the spacecraft and attach it to the Earth-facing port of the Harmony node. The H-II Transfer Vehicle (HTV), launched by the H-IIB Test Flight Launch Vehicle on September 10, 2009 from the Tanegashima Space Center, was successfully berthed at the International Space Station (ISS) at at 6:26 p.m. EDT on September 18. The ingress is scheduled for 6:30-6:40 p.m. today, a day later. Japan Aerospace Exploration Agency (JAXA) posted that the crew will transfer the cargo shipped in the Pressurized Carrier of the HTV to ISS. "Cargo in the unpressurized carrier will be lifted out by the ISS and Kibo robotic arms to be installed onto the Kibo's Exposed Facility. " (Kibo refers to the Japanese Experiment Module.) The HTV is carrying about five tons of supplies to the station. According to NASA, after the activation of the HTV subsystems, Thirsk and De Winne will "perform vestibule outfitting procedures to prepare it for ingress and unloading." 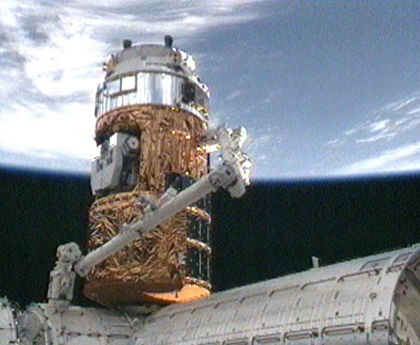 Un-manned Japanese H-II Transfer Vehicle (HTV) being attached via the robotic arm to the Earth-facing port of the Harmony node. Keiji Tachikawa, President of JAXA, summarized the status today: "With the successful berthing at the ISS, the HTV mission overcame the most critical point of the mission. However, the important operations of cargo transfer, departure from the ISS, and re-entry to the atmosphere still remain. We will do our utmost to successfully complete all the tasks of the mission." The HTV thus means another unmanned resupply spacecraft for the ISS. 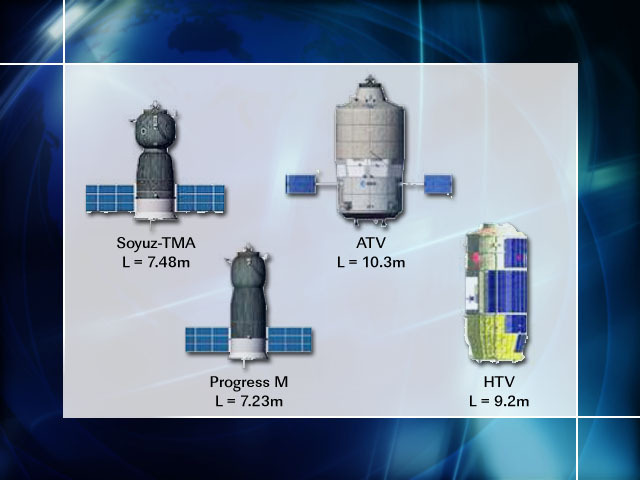 Size comparison of Progress M, Soyuz-TMA, HTV, and ATV.